In Gita Adhyay 9 Shlok 25, God, the giver of the knowledge of Gita, has said that the worshippers of gods go to gods; the worshippers of Pitras (deceased ancestors) go to Pitras; the worshippers of ghosts (who offer Pind) go to ghosts i.e. become ghosts; those who follow scripture-based (according to Holy Vedas and Gita) way of worship, they come to me i.e. they enjoy for some more time in heaven and Great Heaven etc. made by Kaal. 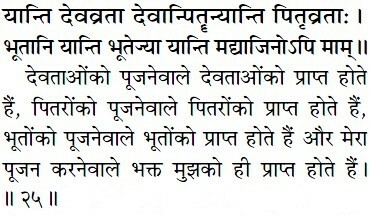 Important: For example, if someone works (service-worship) for a sub-collector, then he can not become a sub-collector. Yes, with the money obtained from him, he will be able to maintain himself i.e. he will remain under him. Similarly, whichever god (Shri Brahma Dev, Shri Vishnu Dev and Shri Shiv Dev i.e. Tridev / the three gods) one worships (serves), he only obtains the benefit granted by him. The prohibition of the pooja of the Trigunmayi Maya i.e. the three gunas (Rajgun-Brahma, Satgun-Vishnu, and Tamgun-Shiv) is also in Holy Gita Adhyay 7 Shlok 12 to 15 and 20 to 23. Likewise, if someone worships (serves) the Pitras, then he goes to them, becomes an inferior Pitra and suffers with them. Similarly, if someone worships (serves) the ghosts (evil spirits), then he will become a ghost because to whoever one is attracted throughout life, in the end his mind remains entangled in them only. As a result of which, goes to them only. A few say that we will continue worshipping Pitras – ghosts – gods and will also keep on doing sadhna by taking spiritual instruction from you. This will not work. It is against the Holy Scriptures to do sadhna which is forbidden in Holy Gita Ji and Holy four Vedas. It has been mentioned in Holy Gita Adhyay 16 Shlok 23-24 that those who abandoning the injunctions of scriptures follow arbitrary way of worship, they neither attain happiness, nor the supreme state, nor only any spiritual success (siddhi) which accomplishes tasks i.e. they waste away their lives. Therefore Arjun, Holy Scriptures are the only evidence for you in the state (principle) of what ought to be done (the acts of sadhna which should be done) and what not ought to be done (the acts of sadhna which should not be done). Other sadhnas are forbidden. Its evidence is also in Markande Puran (published by Gita Press Gorakhpur, on page 237, in which Markande Puran and Brahm Puranank have been bound together) that a worshipper named Ruchi, by practicing celibacy, was doing sadhna according to the Vedas. When he turned forty, he saw his four ancestors who had become Pitras by doing sadhna opposite to the scriptures and were suffering. Pitras said, “Son Ruchi, get married and carry out our shraadhs; we are suffering.” Ruchi Rishi said, “Pitramaho, in Vedas, the path of Karm-Kaand2 (shraadhs, to offer Pind etc) is said to be sadhna of the fools. Then why are you directing me to that wrong (devoid of injunctions of scriptures) sadhna. 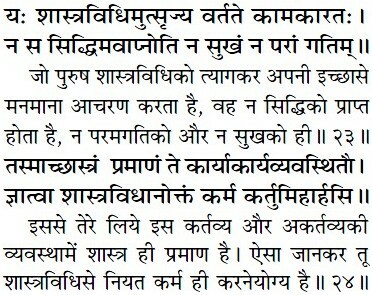 Pitra said, “Son, it is true that in Vedas, Pitra-worship, ghost-worship, worship of gods-goddesses (Karm-Kaand) is called as Avidhya (ignorance / an error); there is no doubt about this.” In this very piece of writing in the abovementioned Markande Puran, Pitras said that but Pitras do give some benefits. Important: These guesses have been made by Pitras themselves; we do not have to follow this because in Purans, there is order of a particular rishi that instructs to worship pitras, ghosts and other gods. But because of not being evident in Vedas is not the order of God. Therefore by violating the order of God on the advice of some saint or rishi3, we will become subject to punishment. Once, a man became friends with a police constable (S.H.O.). That man said to his constable friend that my neighbour gives me a lot of trouble. The constable (S.H.O.) said, “Hit him with a stick. I will deal with it myself.” Obeying the order of the constable friend, that man hit his neighbour with a stick. Because of injury in the head, his neighbour died. Being the officer of that region, that police official arrested his friend and put him in the prison. That man received death sentence. His constable friend could not help him in any way. Because it is the constitution of the King that if anyone will kill someone, then he will receive death sentence. That foolish man violated the constitution of the King by obeying the order of his S.H.O. friend, and consequently lost his life. Similarly, Holy Gita and Holy Vedas – this is the constitution of God in which there is instruction of worship of only one Purna Parmatma (Supreme God); the worship of other gods – pitras – ghosts is prohibited. In Purans, there is order of the rishis (constables). By obeying whose orders and violating the constitution of God, one will have to bear hardships one after another. Therefore worship of other gods is a hindrance in complete liberation/salvation.